Mushrooms contain a number of enzymes. 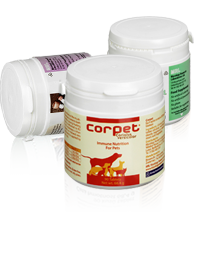 The following table outlines the enzyme content and activity of 500 mg of Corpet. It has been known that enzyme therapy plays an important role in several clinical conditions such as in cancer treatment, malignant lymphoma and cardiovascular disorders (5). The mushroom enzymes in Corpet (Coriolus versicolor) are thought both to prevent oxidative stress and to inhibit cell growth in several diseases (6).